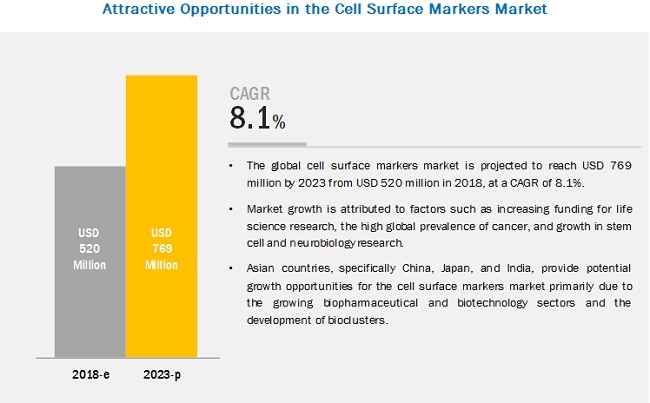 [140 Pages Report] The cell surface markers market is valued at an estimated USD 520 million in 2018 and is projected to reach USD 769 million by 2023, at a CAGR of 8.1% during the forecast period. Factors such as the increasing funding for life sciences research, high global prevalence of cancer, and growth in stem cell and neurobiology research are expected to drive the growth of this market in the coming years. On the basis of antibodies by source, the cell surface markers market is segmented into mice, rats, and other sources. In 2018, the mice segment is expected to account for the largest share of the cell surface markers market. This segment is also expected to grow at the highest CAGR during the forecast period primarily due to the cost-effectiveness offered by mice models as a source of antibody production. The cell surface markers market, by cell type, is segmented into T cell surface markers, B cell surface markers, NK cell surface markers, monocyte cell surface markers, and other cell types. In 2018, the T cell surface markers segment is expected to account for the largest share of the cell surface markers market. The increasing use of these cell surface markers in research and diagnostics is expected to fuel the growth of this segment. Based on application, the cell surface markers market is segmented into research and clinical applications. In 2018, the research applications segment is expected to account for the largest share of the cell surface markers market. The large share of this segment can primarily be attributed to the rising public-private funding for cell surface marker-based research and the growing use of cell surface markers in cancer, stem cell, and HIV research. On the basis of end user, the cell surface markers market is segmented into academic & research institutes, hospitals & clinical testing laboratories, and pharmaceutical & biotechnology companies. In 2018, the academic & research institutes segment is expected to account for the largest share of the cell surface markers market. The growing use of cell surface markers in cancer, stem cell, and HIV research; increasing number of cancer and stem cell research projects across the globe; and the rising public-private funding for cell surface marker-based research are the major factors driving the growth of this end-user segment. 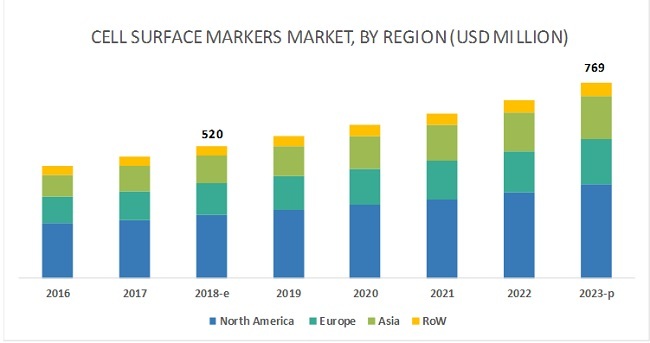 Market growth in North America, the largest regional market for cell surface markers, is primarily driven by the increasing number of R&D activities and the growing use of cell surface markers in personalized medicine and drug discovery & development. However, the market in Asia is estimated to grow at the highest CAGR during the forecast period. The high growth of the Asian market can be attributed to the increasing number of life sciences research activities and government initiatives to boost the biotechnology and pharmaceutical industries in several Asian countries. The cell surface markers market is highly fragmented in nature, with several big as well as emerging players. Prominent players in this market include Thermo Fisher Scientific (US), QIAGEN N.V. (Netherlands), Becton, Dickinson and Company (US), F. Hoffman-La Roche (Switzerland), Bio-Rad Laboratories (US), Danaher Corporation (US), Abcam (UK), GenScript (China), BioLegend (US), Cell Signaling Technology (US), Merck KGaA (Germany), and Bio-Techne (US). Abcam is one of the prominent players operating in the cell surface markers market. The strong position of the company in this market can be attributed to its robust product portfolio. The company has a strong geographical presence in the European and Asia Pacific markets with its manufacturing facilities in the UK, Japan, and China. The company also has significant market presence in the US and Latin America. Thermo Fisher Scientific is another leading player in the cell surface markers market. The company’s strong brand recognition and extensive product portfolio in this market are its key strengths. To maintain its leading position in the market, the company adopts organic as well as inorganic growth strategies such as acquisitions and expansions. In 2018, Thermo Fisher Scientific acquired the Advanced Bioprocessing business of Becton, Dickinson and Company. This will be integrated into the Life Sciences Solutions segment of Thermo Fisher. In 2018, Abcam entered into an exclusive license agreement with Roche. Under this agreement, the product portfolio of Spring Bioscience Corporation has been licensed to Abcam for research use only (RUO) applications. In 2018, QIAGEN opened its new shared service center in Manila—QIAGEN Business Services (QBS). QBS will provide services related to supply chain management, customer care, accounting, technical services, and other sales support activities to QIAGEN'S global operations. What types of cell surface markers are companies exploring? What are the recent trends affecting cell surface markers? What are the new application areas of cell surface markers? 9.3.1.1 Cell Surface Markers are an Emerging Diagnostic Tool in the Field of Hematological Oncology. This study involved four major activities to estimate the current size of the cell surface markers market. Exhaustive secondary research was carried out to collect information on the market, its peer markets, and its parent market. The next step was to validate these findings, assumptions, and sizing with industry experts across the value chain through primary research. Both top-down and bottom-up approaches were employed to estimate the complete market size. Thereafter, market breakdown and data triangulation were used to estimate the market size of segments and subsegments. Secondary research was mainly used to identify and collect information for the extensive, technical, market-oriented, and commercial study of the cell surface markers market. Secondary sources such as The Antibody Society, Pharmaceutical Research and Manufacturers of America (PhRMA), National Institutes of Health (NIH), American Medical Association (AMA), Association of Medical Laboratory Immunologists (AMLI), National Cancer Institute (NCI), American Society of Clinical Oncology (ASCO), American Association for Cancer Research (AACR), European Medicines Agency (EMA), and the British Society for Immunology (BSI) were used. These sources were also used to obtain key information about major players, market classification, and segmentation according to industry trends, regional/country-level markets, market developments, and technology perspectives. The cell surface markers market generated by leading players has been determined through primary and secondary research.